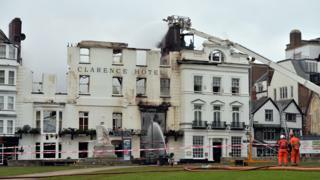 The front of England's oldest hotel, which was destroyed by fire last October, is set to be restored. 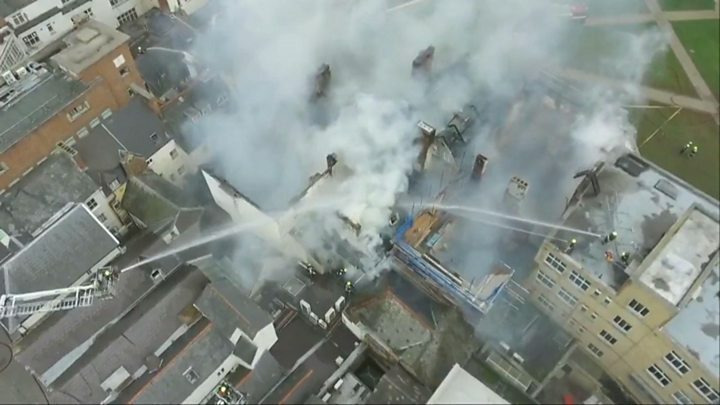 A blaze damaged buildings on Cathedral Green in Exeter before spreading to the Royal Clarence Hotel, which dates back to 1769. Architects say the new facade has been designed to stay as true as possible to the original. The rebuilding of the hotel is expected to take 18 months to complete and it is due to reopen in 2019. Owner Andrew Brownsword said some features like iron work and stained glass windows would be fully restored. He said: "This is such a wonderful moment, after the initial heartbreak and months of deconstruction, to start to look towards to the future and to restoring the Royal Clarence's historic frontage." Architect David Shatwell said: "Having taken every effort to stabilise the building, save as much as possible of what remains and prepare detailed research into the history of the building... we are delighted to now be taking the first steps toward rebuilding this beautiful building." The plans for the facade will be on display at St Martin's Church in Cathedral Close between 14:00 and 20:00 on Wednesday, 26 July. The plans for the interior of the hotel are still being worked on and they will need to be approved before work begins.